A 1987 paper in the prestigious journal Nature reported that “all mitochondrial DNA stems from one woman” and that she had lived in Africa some 200,000 years ago. The paper, authored by Rebecca L. Cann, Mark Stoneking, and their doctoral advisor, Allan Wilson, at the University of California, Berkeley, aroused intense interest and controversy for many reasons, and it continues to do so. The authors referred to the samples they analyzed as “mitochondrial DNA,” whereas the press dubbed them “mitochondrial Eve”—far more memorable, but also subject to misinterpretation. This Eve was not the single and only woman living at the time, as was said of the Eve of Genesis. In addition, the literal Biblical interpretation computed the age of humans to a time measured in thousands of years, not 200,000 years. Moreover, many evolutionists believed that humans evolved in separate parts of the world at about the same time, rather than the “Out of Africa” theory, in which Anatomically Modern Humans originated in Africa and then migrated worldwide. Cann and her colleagues analyzed mitochondrial DNA (mtDNA) and not nuclear DNA (nDNA), the latter responsible for transmitting the color of our eyes, racial characteristics, and susceptibility of certain diseases; mtDNA only codes for manufacturing proteins and performing other mitochondrial functions. Present in all cells of our body, nDNA is a merger of our mother’s and father’s DNA (recombination), whereas mtDNA is derived virtually exclusively from the maternal side with few if any mtDNA contributed from the sperm. Closely related individuals have almost identical mtDNA, with occasional mutations arising over thousands of years. It is assumed that the fewer the number of mutations, the shorter the period of time since common ancestors diverged. Proponents of mitochondrial Eve do not suggest that this Eve was the first woman or only woman living at the time. Rather they estimate that some catastrophic event occurred, dramatically reducing Earth’s population to some 10,000–20,000, and that only this Eve had an unbroken line of female descendants. Eve was said to be the most recent common ancestor from whom all living humans descended. SEE ALSO: Anatomically Modern Humans (c. 200,000 BCE), Mitochondria and Cellular Respiration (1925), Domains of Life (1990). 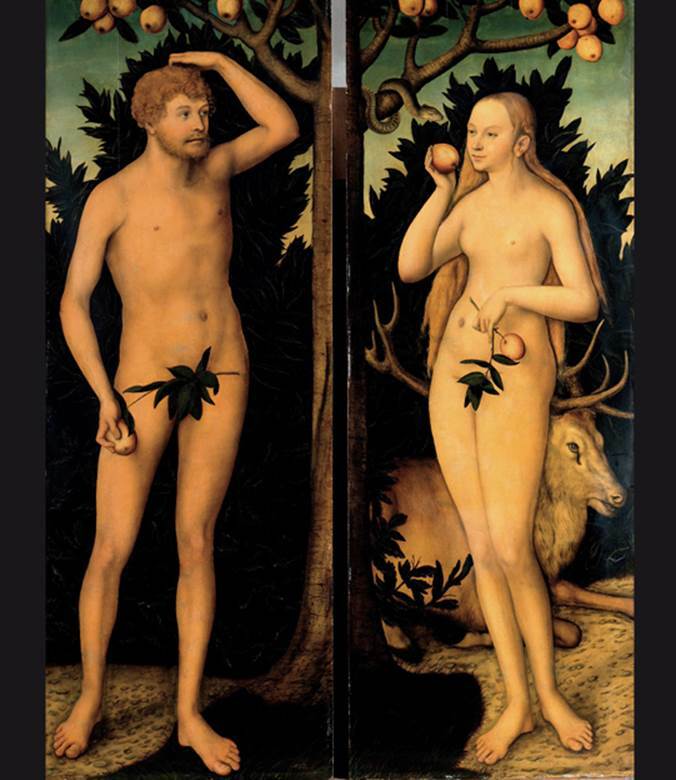 Adam and Eve, completed after 1536 by the German Renaissance painter Lucas Cranach the Younger (1515–1586).